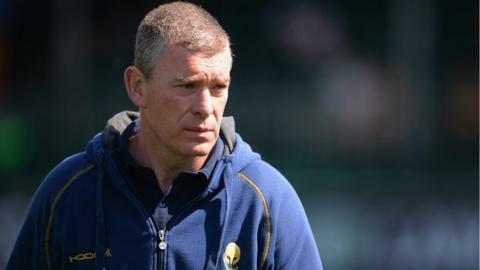 Worcester Warriors director of rugby Dean Ryan says their excellent form has made team selection a real challenge ahead of Saturday's trip to London Scottish. Warriors have won 13 matches in a row in all competitions and a 14th would take them top of the Championship. "It's becoming difficult to select," Ryan told BBC Hereford and Worcester. "Some of the selections are based on previous form and experience but that won't last until the play-offs." Ever since their last-gasp opening day defeat at current leaders Bristol, Warriors have strung together an impressive sequence of results, winning seven successive Championship matches to move second in the table, just two points behind. Their form has not dipped when Ryan has made changes, and the team have also qualified for the quarter-finals of the British & Irish Cup with six wins out of six. "We're really pleased with the tournament as a whole - it's got us used to winning," Ryan said. The club's second team, the Cavaliers, also boast a 100 per cent record so far this season and are through to the A League semi-finals. Ryan is happy that the club's squad players are putting pressure on the more established names. "There's a lot of heat coming from the A League and players will get in and play because we're not going to allow reputations to be a block. "It's brilliant having competition and changing all the time but it also erodes some of the things you get with continuity," he added. Ryan has stuck with virtually the same side that beat Nottingham in their last B&I cup match for the game against London Scottish, but Nick Schonert comes in at tighthead for his first appearance since September. London Scottish: Lydon; Williams, Hawke, Sloan, Mantella; Newton, Heeks; Hallam, Kwasnicki, Maidment, Phillips, Gillanders, Best, Walker, Bright (c). Replacements: Lilley, Cherry, Prescott, Brown, Pennycook, Calder, Braid. Worcester Warriors: Pennell; Smith, Stelling, Mills, Biggs; Lamb, Arr; Rapava Ruskin, Creevy, Schonert, Williams, O'Shea, Thomas, Betty, van Velze (c). Replacements: George, Bower, Rees, Senatore, Mulchrone, Mieres, Symons.